Last week on #pndhour we discussed the ups and downs of recovery from Perinatal Mental Illness. One of the most frustrating things about getting better is that just when you think you’re making lots of progress and starting to get somewhere you can be slammed by a setback which leaves you terrified that you’re back to square one. The truth is you aren’t back to square one and you never will be. It’s not possible to be, save for a bout of amnesia, because you’ve learnt so much already about how to cope and how to manage your anxiety. In fact, in the book that really helped me (that I’ve mentioned many times!) – Paul David’s Anxiety No More – he tells us to actually welcome those setbacks as they are a chance for you to practice what you’ve learned. Although I’m not sure “welcoming” them is a particularly helpful phrase, I certainly agree that finding a way to accept them and reminding yourself that you will learn from the setback and come out stronger on the other side, and closer to wellness, is really helpful. Anxiety is a liar. Or, at the very least, a distorter of truth. When you begin to feel better you are quite easily able to see the irrational fears and thoughts for what they are and are able to begin countering them with facts. However, when you’re hit with a setback you become vulnerable once more, you can start to believe in Anxiety’s lies again – e.g. “I hate being a mum”, “I’m a bad parent”, “I can’t cope”, “I’ll never get better” etc. Half an hour later I was back to constant panic, and all the dreadful symptoms that accompany it, but that piece of paper was hard proof that I had had a moment that day when I felt calm. I dragged that note, and others like it, around with me for weeks to bring me comfort every time the anxiety threatened to overwhelm me. Often we feel like two people when we have anxiety; the panic-filled, fidgeting person who nobody is able to comfort and the calm, rational person who begins to make brief appearances during moments between anxiety attacks. If we can give the calm version of ourselves a voice that can be heard even during a later attack we can start to build our confidence about defeating anxiety. 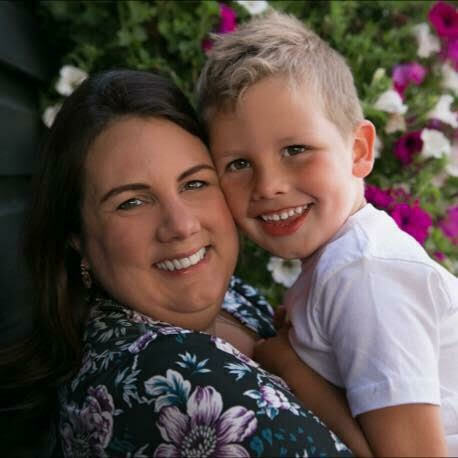 Which is the key really – confidence that we can handle this – anxiety attacks, motherhood and life. Eventually, the scrawled notes I carried around became a Notes doc in my phone of what I call my Anxiety Cheat Sheet. It’s a collection of everything I need to read, hear and do to manage a setback or anxiety attack should it rise up again. Simply having something like this close to you can make you feel calmer and perhaps prevent an attack. 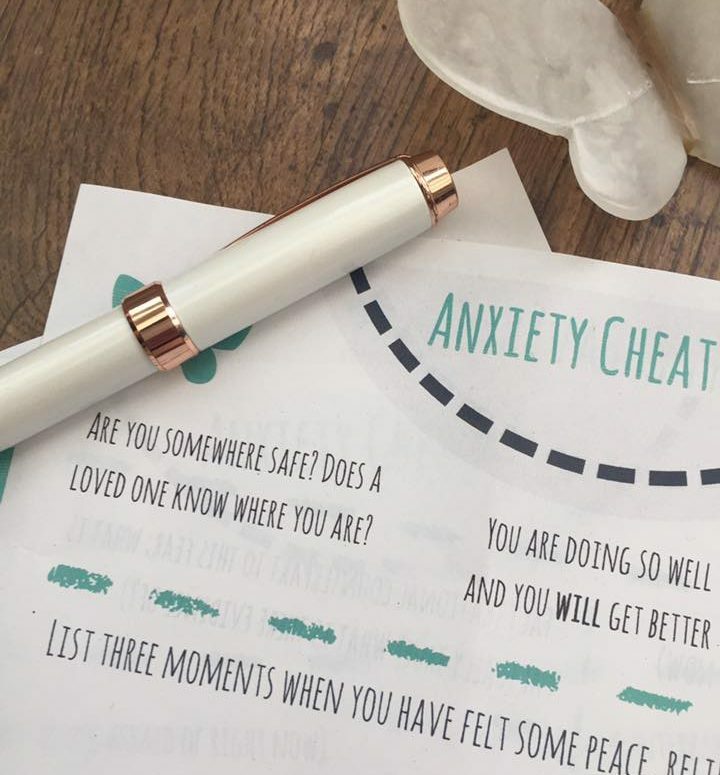 Everyone’s needs are different of course and we all find relief in different things so below I’ve put together a printable you can use to build your own Anxiety Cheat Sheet. The idea behind this sheet is that you fill it in when you’re feeling a little better and then you have something to refer back to during the recovery setbacks that will build your confidence in your recovery and bring you relief from the anxiety. The cheat sheet should be slowly build up over time, adding new evidence of your recovery and new self-care and comforting items as you discover them. Disclaimer: I am definitely not a CBT therapist (or any other kind! ), this is just a technique that I found really helped me personally. If possible and available, I highly recommend finding a therapist who helps you to counter your irrational or negative thinking under professional guidance. Next Next post: Mobile Monitoring App for Kids – Good Motherhood or a Risk? Great tool to help others with anxiety. I may use it during some of my counseling sessions. thank you. That would be wonderful! I’m glad you find it helpful.